Chain of Mercy by Brenda Anderson is a wonderful contemporary Christian romantic novel. It is the first book in the Coming Home series and wow what a series it promises to be. 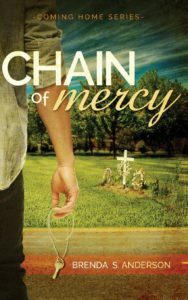 There is just so much in Chain Of Mercy – a fabulous storyline, numerous themes, and a novel that honours God. It is hard to know where to start. God is very much at the heart of the novel. God is faithful. We may move away from Him but He will never move away from us. Sometimes we use our busyness as an excuse and we drift away from God. “Being busy always kept God at bay.” God will wait in the shadows, waiting lovingly for us to return. The novel shows the need for grace. We all need grace. And we all need to extend grace. We have all sinned but there is no condemnation from Jesus, just love and grace. A major theme in the novel is forgiveness. We all need to receive forgiveness. We all need to give forgiveness. It is often easier to forgive others than to forgive ourselves. “Everyone’s forgiven you. You need to forgive yourself.” God says we are loved and forgiven. We need to believe Him. To withhold forgiveness can make one bitter. Life can become a downward spiral. That is when we need to recognise our need for God and for His help to extend forgiveness. Not in our strength but in His. Prayer is of vital importance. “His knees were going to receive a workout tonight.” In times of trouble and uncertainty we need to pray. In times of thankfulness we need to pray. Prayer is a conversation with God. Chain Of Mercy shows the difference between having religion and having a relationship with God. Going to church will not make you a Christian. Having a relationship with Jesus will alter your life. Living by Jesus’ rules will open your eyes to the world around you. Going to church may not alter you in the slightest. Within the novel there are characters running from God. Some characters run because they mistakenly believe that God could never love them after what they’ve done. They do not realise that God loves them with an everlasting love. Other characters turn their back on God because they wrongly believe that a God of love would not let bad things happen to Christians. “God had been number one in Justin’s life but God had let her brother down.” Being a Christian does not make us immune to bad things happening but when they do, we know that God is right there walking alongside us. Chain Of Mercy shows the value of human life from conception. Our lives and those of others are to be treasured. We are to see each life as more than an inconvenience or a trophy. Each life is precious to God. Each life should be precious to us. Chain Of Mercy is such a marvellous novel. Brenda Anderson is a wonderful writer who displays depth and sensitivity. The reader gets completely caught up within the pages of her novels, living out the story, rather than just reading the pages. I love everything that Brenda Anderson writes. Her stories always honour God. Her characters are always realistically drawn and easy to empathise with. Treat yourself today – buy Chain Of Mercy, grab a drink and settle down and immerse yourself within the novel. Let the world go by without you! Thank you, Julia, for this heartfelt review! I’m so very glad you enjoyed Chain of Mercy! 😀 Thank you for helping to spread the word!